Fifty goals in fifty games is an incredible accomplishment and a quirky milestone the hockey world treats with reverence. Officially the milestone is 50 goals in the team's first 50 games of the regular season. This has happened eight times in NHL history, and not since Brett Hull did it in back-to-back seasons (1990-91 and 1991-92). There have been unofficial 50 in 50s, as five times a player had 50 goals in his first 50 games of a season but not the team’s. No one has done that since Cam Neely in 1993-94. Alex Ovechkin of the Washington Capitals has an outside chance to craft his own version of the NHL's 50 in 50. He scored 23 goals in the final 23 regular-season games in 2012-13 and he hasn’t stopped this season, with 17 in his first 20 games. That's 40 in 43 games -- he had 40 in 42 before his team was shut out Wednesday by the Pittsburgh Penguins. Can Ovechkin score 10 times in his next seven games? Obviously it wouldn't be an official 50 in 50 if he pulls it off, but it might be seen as the greatest scoring surge of the past 20 years. The chart below shows just how dominant the Great Eight has been. 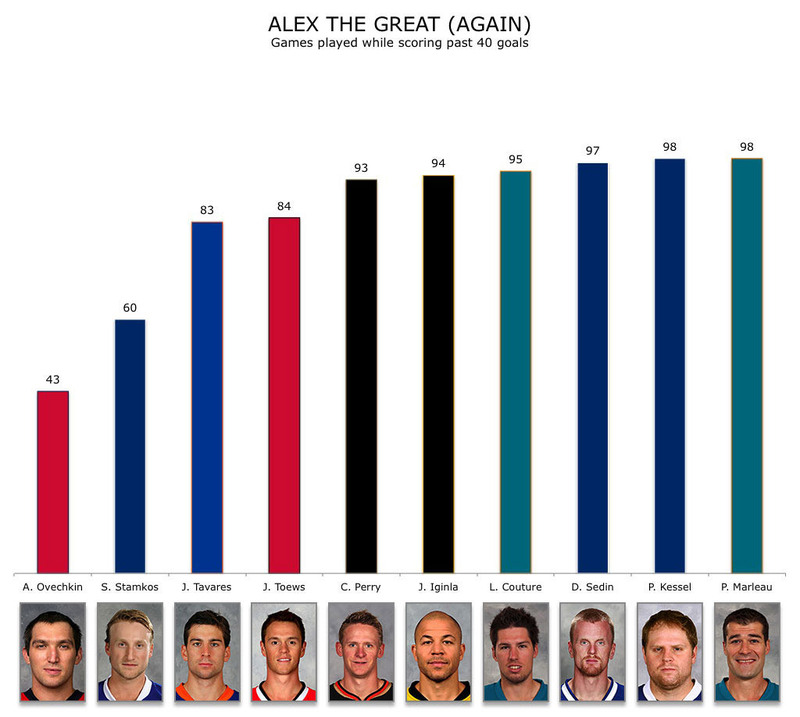 It is a list of the top 10 goal scorers in the past three-plus seasons, a timeframe that starts in 2010-11 when Ovechkin stopped being the game’s premier goal scorer (he's "only" been second behind Steven Stamkos). Stamkos is the only one near Ovechkin, with most of the other players clustered scoring a similar rate. The strong start to the season for Ovechkin leads to projections and guesses and pulling a number out of nowhere to try and determine his goal total in 2013-14. Former Washington coach Bruce Boudreau said earlier this week he thinks Ovechkin still has the capacity to reach 70 goals in a season. Ovechkin's career high is 65, and he is shooting the puck a ton in 2013-14, enough to be on pace for the third-highest single-season total in League history. One thing working against Ovechkin is precedent. Ovechkin turned 28 years old in September, so this is his age-28 season. A player has scored 70 goals in an NHL season 14 times, but only once has a player been older than 27 (see chart on right); Phil Esposito was 28 when he scored 76 in 1970-71. A player has hit 65 a total of 24 times in NHL history, and Esposito, Mario Lemieux and Lanny McDonald all poured in at least 65 at 28 or older. Were Ovechkin to reach 65, he’d be the sixth player ever to do it more than once. The Capitals captain also would have six years between 65-goal campaigns. The longest any of the other five repeat members of the 65-goal club went between reaching the milestone was four years when Lemieux had 85 in 1988-89 and 69 in 1992-93. There also is the matter of Ovechkin's shooting percentage, which is currently a career-high 15.2 percent. He does have two seasons at about 14.5 percent, so it’s not a complete outlier. Ovechkin currently is on pace for between 70 and 71 goals. If his shooting percentage drops he’ll need to shoot more to maintain this incredible pace. He has diversified his offensive output, improving at even strength, which was going to be a necessity as the season progressed. His team has been benefitting from the scoring haul, and the Capitals have returned to the Super 16 for the first time since the opening days of the 2013-14 campaign. DISCLAIMER: While the Super 16 is NHL.com's weekly power rankings, the new-look version is going to focus more on the "power" than the "rankings" when determining the order. It’s not always going to look like the League standings, and will likely take more of a long view than a short one. Stop by to see where your favorite team ranks, but stay for the information. Also, the statistics and team records are through the games on Wednesday night. The Blues thumped the Colorado Avalanche and grinded one out against the Pittsburgh Penguins. Alexander Steen just keeps scoring. They did outshoot the Washington Capitals 47-20 and rack up 85 shot attempts in their only loss of the past week, which came in their third game in four nights and the second half of a back-to-back. But that shot disparity was score effect-related, as St. Louis quickly fell behind 3-0 to the Capitals. MUST READ: Tyler Dellow of mc79hockey came up with an approximate Corsi value for teams from 1997-98 to 2006-07, before any of the advanced statistic websites began to track it. The Blues, with Chris Pronger in his prime, were really good at possessing the puck. A couple of ugly losses, but also a convincing victory against the San Jose Sharks and a big addition in a busy week for Chicago. Kris Versteeg at $4.4 million per season to be a first-line player based off the 2011-12 season isn't exactly ideal, but Versteeg at $2.2 million per year as a team's fifth or sixth-best wing option could be a dandy of a bargain for the Blackhawks. MUST READ: The team's start hasn't been perfect but the results have been there, writes Tim Sassone of the Daily Herald. Each of the top three teams took a healthy loss, and San Jose's was to the team directly above them. There were three straight victories before that to ease any concern after an 0-1-4 stretch. He’s no longer possessed by Teenage Mutant Ninja Hertl power, but Tomas Hertl has continued to score after celebrating his 20th birthday Nov. 12. MUST READ: Ryan Kennedy of the Hockey News writes about the Sharks providing the "speed, speed and more speed" template (that's a popular one in the Western Conference). The Kings have remained a dominant team with the puck for much of the season that just needed slightly better goaltending. That this stellar goaltending is now coming from The Professor, Ben Scrivens (one cheer for a quality nickname and one for it not being Scrivs or Scrivie), has been surprising. He'll regress some as the workload piles up with Jonathan Quick out, but the Kings could also score more as well. MUST READ: Jewels From The Crown has a player-by-play look at zone entries and scoring chances for the Kings. Another team with mostly a run of good form and a hiccup (a 6-2 loss in Montreal) mixed in. Josh Harding continues to be one of the top stories of the season. Ryan Suter is a Norris Trophy favorite. The kids are getting better. The Gophers are a near-unanimous No. 1 in the country. Even the Timberwolves are above .500. Life is good in the Twin Cities. MUST READ: Dan Myers investigates just how Suter is able to play more than 30 minutes with regularity and still be effective. The Coyotes have 31 points. They haven't lost to a team that currently has less than 31 points since Oct. 15, a span of 14 games. They have only two such losses all season. If this were an RPI-style rankings, they’d likely be a couple spots higher. Their high volume of shots allowed remains a bit of a concern. MUST READ: Five For Howling has an interesting roundtable chat with play-by-play man Matt McConnell to assess the team's hot start and other topics. The Bruins have won six of seven, a streak that began at the start of a schedule run on Eastern Conference foes. Eventually, it will end at 15 of 16 games against the East, and Boston will likely have a lot of points accrued in those 16 contests. Boston has yielded 10 goals in these seven games, and only allowed more than two in six contests this season. MUST READ: Much like the Blackhawks or Sharks, there are some nits to pick at occasionally in an otherwise successful start, Steve Conroy of the Boston Herald writes. From the best start in franchise history to three straight losses and eighth place in the conference. Navigating the West is going to feel a little like defending a base on Hoth at times this season. The win against the Blackhawks was a nice way to bounce back. Matt Duchene has been phenomenal, and the Avalanche probably cannot afford to have his oblique injury linger. MUST READ: Sean McIndoe explores why the Avalanche have been able to rebuild quickly while the Edmonton Oilers have not. Back-to-back wins against the Anaheim Ducks and the Washington Capitals likely eased some concerns about the stuttering offense. Evgeni Malkin isn’t scoring goals and is passing up too many chances to shoot, but he had a great third period against the Ducks and destroyed the Capitals. Marc-Andre Fleury has quietly led the League in minutes played through Wednesday's games while fashioning a .924 save percentage. MUST READ: The Penguins look pretty competent on defense, and the duo of Paul Martin and Brooks Orpik deserve a lot of credit for that, writes Jimmy Rixner of Pensburgh. The West is 87-38-16 against the East, a dominance that has been well-documented. The strangest twist is suddenly the Ducks, who were still first in the West by total points Thursday morning (eighth in points percentage) but have lost five in a row, all to teams from the East. MUST READ: Monday night was the first time Teemu Selanne did not score in a game in Pittsburgh. Seth Rorabaugh of the Pittsburgh Post-Gazette's Empty Netters took a trip down memory lane to revisit Selanne's past work in the city. While the Ducks had an 0-fer trip to the East, the Stars pillaged Western Canada for three straight victories. The night spent in Calgary was particularly bountiful for Tyler Seguin and Jamie Benn, who have combined for 46 points, and both sit tied for eighth in League scoring with 23 points. They're both on pace for 94 points. The franchise hasn't had two players score 80 in the same season since 1993-94, its first in Dallas. It hasn't had two rack up at least 94 since 1981-82. MUST READ: Sean Gordon of the Globe and Mail writes about the rigors of playing defense at center for kids in the NHL with Seguin playing a prominent role. The Canucks have lost seven of nine games and are in danger of falling into a pretty serious hole in the conference. None of the first six losses were particularly bad (all good teams, though the 5-1 scoreline at Los Angeles wasn't flattering), but losing at home to the Florida Panthers will likely incite some panic among the faithful. Vancouver has had more than 52 percent of the shot attempts at even strength in the past four games and more than 50 percent in six of eight. The luck will likely turn in the coming days. MUST READ: Daniel Wagner of Pass It To Bulis writes about Zack Kassian's trouble with zone exits for the Vancouver Sun. The Capitals have won seven of 10 and created some space between them and the quagmire of teams chasing Pittsburgh in the Metropolitan Division. They also had their first test against the Penguins on Wednesday night, and it didn't go well. The issues are pretty simple: Washington is great on special teams, but the shots against are too high and the shots for at even strength are too few. As the Capitals found out last season in the first round, trying to rely on special teams can backfire at that time of year. MUST READ: Muneeb Alam of Japers' Rink tries to find an optimal lineup for the Capitals. HINT: It's the one that includes a top-four defenseman from another organization. Adding Peter Holland might be more than just a short-term solution if the former first-round pick is able to finally find his way at the NHL level. Getting Tyler Bozak back will help from a manpower standpoint, but he’s not likely to have a dramatic (positive) effect on the puck possession numbers. MUST READ: Randy Carlyle is cognizant of Toronto's puck possession issues, but the Maple Leafs aren’t afraid of the fancy stats, writes Sean Fitz-Gerald of the National Post. It's still too early to tell how much losing Steven Stamkos is going to hamper the Lightning. They played really well against Montreal and Anaheim, and then didn't in Phoenix and Los Angeles. Even with him, it's certainly plausible this would not have been a very successful trip to the West Coast. After completing this four-game trek, 10 of the next 11 games are against conference foes. MUST READ: Tom Jones of the Tampa Bay Times writes about the marvel of Martin St. Louis and his 1,000th NHL game. The injuries on the blue line can only explain so much of the problems for the Red Wings at this point. Pavel Datsyuk and Henrik Zetterberg have been scoring, but they’re not getting a lot of help. Gustav Nyquist would definitely help if Detroit could find enough cap space to fit him in, but he’s not going to be the magic elixir, either. MUST READ: The Wings are definitely scuffling, and Ted Kulfan of the Detroit News points out five reasons why.